Be the first to review this 2018 Kia Sedona. A competitor in the minivan market since the 1990s, Kia soldiers on with its latest, third-generation Sedona. Last redesigned for the 2015 model year, the Sedona shows no significant change for 2018. Other minivan makers have modified their offerings in recent years to reflect a new age of family transportation. Kia’s Sedona sticks closer to the past. Five Sedona trim levels are available: L, LX, EX, SX, and SX Limited trim levels. In each Sedona, a 3.3-liter V6 develops 276 horsepower and 248 pound-feet of torque. All versions use a somewhat antiquated 6-speed automatic transmission, mating with front-wheel drive. In the interest of fuel economy, most automakers have moved to transmissions with a greater number of gear ratios. Gas mileage for the Sedona scores right around average for the minivan class. 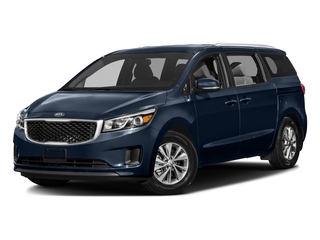 Compared to some minivans that have been redesigned lately, Kia’s version tends to lean toward the old-fashioned, if not antiquated, end of the spectrum. Such competitors as the Honda Odyssey, Toyota Sienna, and Chrysler Pacifica tend to stand taller in terms of contemporary features and passenger conveniences. Still, Kia’s people-carrier gets the nod in overall value, priced at a more accessible value than most of its rivals. Crash-test ratings have been quite good, but advanced safety features are limited to higher trim levels or extra-cost option packages. The National Highway Traffic Safety Administration awarded the Sedona a five-star rating overall, as well as for both frontal- and side-impact crash tests. Like most taller vehicles, the Sedona got a four-star rating for rollover resistance (a calculated figure). The Insurance Institute for Highway Safety gave the 2018 Sedona Good scores for each crash test, but it was not rated in the small-overlap front test for the passenger side. The Superior rating for frontal crash prevention is valid only when certain optional equipment is installed. Headlights are rated Good; but again, only if optional units are installed. All Sedonas have a rearview camera. Surround-view cameras are standard only on the top model. Additional safety technology on the SX Limited includes forward-collision warning with automatic emergency braking, adaptive cruise control, and blind-spot monitoring. Such features cost thousands of dollars extra, bundled into option packages for lower trim levels. LX ($29,000) gets a three-seat second-row bench for eight-passenger capacity, a power driver’s seat, and power sliding side doors. Leather is optional. EX ($33,700) adds leather seat trim, heated front seats, pushbutton start, front/rear parking sensors, rapid-charge USB ports, a 3.5-inch driver information display, and 18-inch wheels. SX ($37,000) adds an 8.0-inch touchscreen, navigation, Infinity 8-speaker surround-sound premium audio, power front passenger seat, ventilated front seats, and heated second-row seats. Blind-spot detection and rear cross-traffic alert are included. SX Limited ($42,000) includes 19-inch chromed wheels, a surround-view camera system, pushbutton start, and woodgrain trim. Safety features include lane-departure warning, autonomous emergency braking, and adaptive cruise control. Options include second-row lounge seats, a dual-pane sunroof, and Nappa leather. Styling of the Sedona might qualify as virtually timeless, but nothing about its appearance ranks as adventurous. A few years back, Kia’s minivan looked sufficiently compelling visually, but freshly redesigned and recently-launched competitors, such as Chrysler’s Pacifica, have altered the minivan landscape. Sitting upright, the Sedona grille is bracketed by LED running lights. Along the body, designers have exercised restraint with the chrome trim, though sheetmetal creases do tend to attract the eye. A bodyside step-up at the rear makes the glass appear to narrow, making the roof almost seem to disappear toward the back. Traditional-type luxury rules the Sedona cabin, at least in upper trim levels with their leather-upholstered seats. Lesser-level models aren’t quite as enticing, but detail work has been adapted from Kia’s upscale sedans. Not only is the cabin quiet on the road, it’s easily reconfigurable. In eight-passenger models, the second row contains a bench seat that slides forward, tucking against the front seats. The third-row seat folds into the floor, fully out of the way. Seven-passenger Sedonas substitute a pair of captain’s chairs, which provide a pleasing lounge-type ambiance but take up more space than the bench would. Even so, the cabin doesn’t seem cluttered. Horizontally laid-out, the dashboard is a bit dull, but regions of piano-black trim helps with eye appeal. So do two-tone color schemes. Upper trim levels benefit from soft-touch materials on the doors and dashboard. Front and second-row seats promise fine comfort, but third-row space is the smallest in a contemporary minivan. Head clearance out back is limited, too. Front seats are wide and abundantly padded, separated by a wide center stack. Small-item storage consists of dual gloveboxes (one cooled), door and dashboard bins, and a massive center console. Top models add a tiered tray and a sliding console armrest. UVO infotainment is simple to use and Apple CarPlay compatible. With second- and third-row seats folded, cargo space can reach 142 cubic feet. With all seatbacks upright, volume totals 33.9 cubic feet, growing to 78.4 cubic feet with the third row down. Occupants can anticipate a softly supple, well-composed ride. Not surprisingly, handling is on the sluggish side. Tires can squeal considerably when cornering, accompanied by body lean. Acceleration is less than spirited, due in part to vehicle weight, but satisfactory for this league. Fuel economy trails that of newer minivan models. Some shakiness in the steering column might be noted, but the Sedona isn’t prone to wander past the highway’s crown. On the whole, the Sedona behaves more like a minivan from the past than the present day. A Sedona can tow up to 3,500 pounds, though a full load of passengers could turn that task into a struggle. Gas mileage varies slightly by mode, reflecting a difference between power-steering systems. Base Sedonas are EPA-rated at 18/24 mpg City/Highway, or 20 mpg Combined. SX trim is EPA-rated at 18/25 mpg City/Highway, or 21 mpg Combined, whereas the SX Limited estimate dips to 17/22 mpg City/Highway, or 19 mpg Combined. Despite an ample collection of standard features, the Sedona falls below today’s minivan norm in terms of utility, flexibility, and safety technology - though crash-test scores are good. Still, it comes close enough to competitors to make it worth considering, for one reason: price. An EX with few options can provide fine value, though a few thousands of dollars more would buy a fully up-to-date Honda Odyssey or Chrysler Pacifica. 2018 Kia listings within 25 miles of your ZIP code. Find 2018 Kia listings for sale near you.